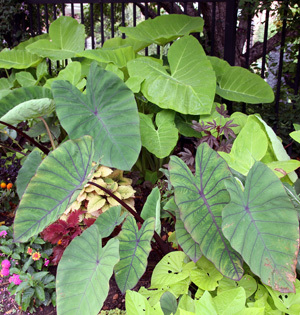 Elephant ears is the common name for a group of tropical perennial plants grown for their large, heart-shaped leaves. 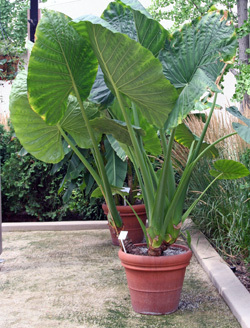 “Elephant ears” is the common name for a group of tropical perennial plants grown for their large, heart-shaped leaves. 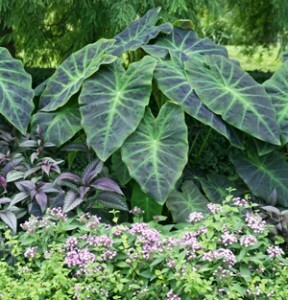 Most of these herbaceous species in the arum or aroid family (Araceae) that are offered as ornamentals belong to the genera Colocasia, Alocasia, and Xanthosoma, although there are others that have similar appearance and growth habits. An Alocasia growing in Fiji along a roadside. The first two genera are native to tropical southern Asia, Indonesia, Malaysia, New Guinea, parts of Australia, or the Pacific Islands, while Xanthosoma is native to tropical America. Many of the species have long been grown for the edible starchy corms or tubers as an important staple food in tropical regions. Taro (Colocasia esculenta) tubers (L) and tannia or tiquisque (Xanthosoma sagittifolium) tubers (C) for sale in a Costa Rican market, and Alocasia tubers for sale in Fiji. The leaves are edible, but they (and all parts of the plant) contain needle-like crystals of calcium oxalate which are a skin irritant, so they must be cooked first. 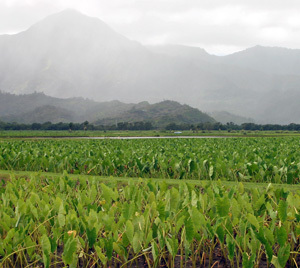 Fields of taro, Colocasia esculenta, in Hawaii. 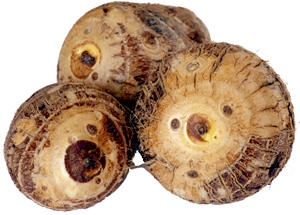 One of the most widely grown species is C.esculenta, called taro and many other common names. It has been cultivated in Asia and Polynesia for thousands of years, with over 200 cultivars selected for culinary or ornamental characteristics. This species naturalizes readily in wetlands in mild climates and is considered an invasive species along the Gulf Coast. 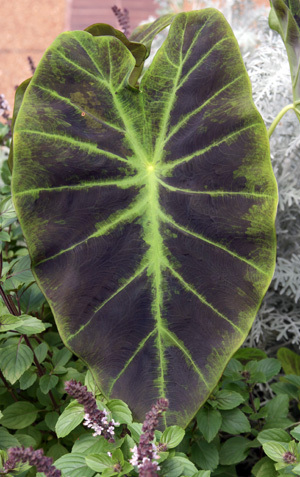 In cooler climates elephant ears are grown for their large leaves. In the Midwestern garden these plants are grown for their flat sagittate (arrow- or heart-shaped) leaves that often have prominent veins. In their native habitat the smooth, waxy leaves will grow 3 feet long and 2 feet wide or more (depending on the species) but they tend to be much smaller when grown as a seasonal plant. The leaves are held on the end of long petioles coming directly from the underground corm. The leaves are held on the end of long, thick, succulent petioles coming directly from the underground corm. The petiole attaches near the center of the lower surface of the leaf (peltate) and the leaves are held perpendicular to the upright petiole with the leaves facing upward or outward. Alocasia calidora showing upright leaves on long petioles. but some types also produce long, slender stolons (above ground runners), and others do not form corms. The lumpy corms with rough ridges have a brown skin and a white or pink interior. Some types of elephant ears also produce smaller tubers or “cormels” (also called “eddos”) which grow off the sides of the main corm. 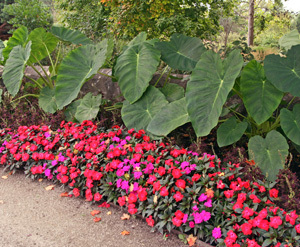 Although elephant ears are grown primarily as foliage plants, they can bloom – but flowers are not common in the Midwest. The inflorescences are the typical aroid type with a white to yellow or light green spathe surrounding the spadix. They can be large, fragrant and attractive, but are normally hidden underneath the foliage. Fruits are globular green or yellow berries containing several seeds. The flowers of Alocasia are a typical aroid type (L) with a white to green spathe surrounding a white or cream spadix (LC, C and RC), and may be followed by globular berries containing several seeds (R). ‘Black Coral’ – one in the Royal Hawaiian® Series with huge, glossy all-black corrugated leaves. 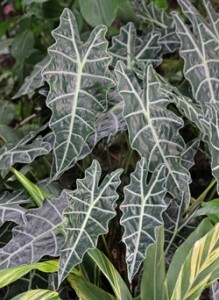 ‘Black Magic’ – was the first black cultivar with dusty purple-black leaves (with green undertones in shady conditions), the blades slightly folded upwards, and dark petioles. It does not form corms. 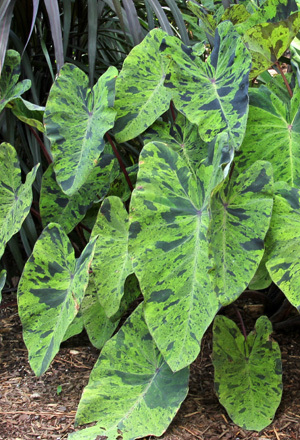 ‘Blue Hawaii’ – one in the Royal Hawaiian® Series with medium green leaves with dark purple-black veins and a maroon underside. ‘Burgundy Stem’ – is a tall cultivar with deep purple petioles topped with big green leaves with a slight purple tinge. 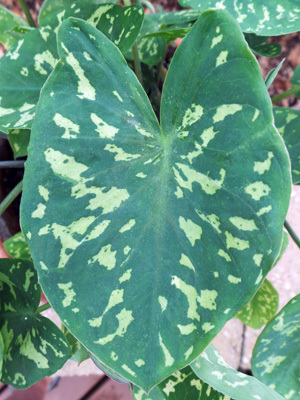 ‘Coal Miner’ – is similar to ‘Illustris’ but is much earlier, does not spread underground as vigorously, the background leaf color is darker, and the leaves have a velvety patina when they first emerge. ‘Coffee Cups’ (sometimes incorrectly called ‘Tea Cups’) – is a vigorous hybrid with smaller leaves on very tall dark petioles with the blades folded upward to form a cup-shape. ‘Diamond Head’ – has glossy purple, slightly puckered leaves (PP19939). ‘Elena’ – has chartreuse leaves similar to ‘Lime Zinger’ but with cream-colored petioles that change to purple where they join the leaf and veins where the stalk attaches. It will spread by aboveground rhizomes when planted in moist sites. 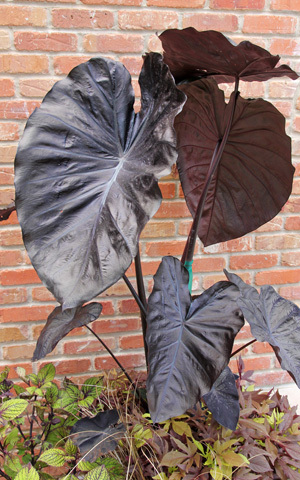 ‘Fontanesii’ (violet-stemmed taro) – is a tall hybrid with dark green leaves with a shiny black cast on dark petioles. ‘Hilo Beauty’ – is a small variety (about a foot tall) of Alocasia with irregular yellow or cream flecks on the dark green leaves. ‘Illustris’ (imperial taro, var. antiquorum) – has dark green matte leaves with a purple to black luster and bright green veins and petioles. The plants spread by underground runners. 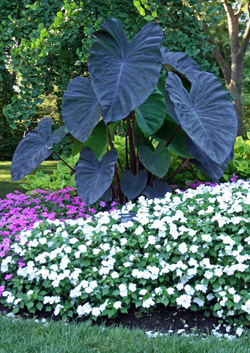 Color is more intense in bright light, but the leaves are never as dark as ‘Black Magic’ or many other black varieties. ‘Jet Black Wonder’ – has light-colored veins on a black background. 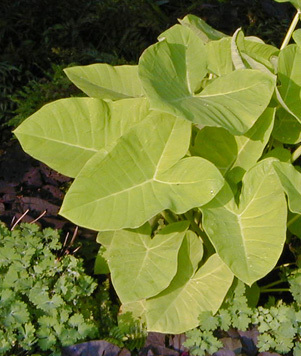 ‘Lime Zinger’ – is a brilliant chartreuse green Xanthosoma. ‘Mojito’ – has dull green leaves irregularly splotched, speckled, and streaked with black on dark or pattterned petioles. ‘Nancy’s Revenge’ – the leaves change as the season progresses, starting out all green, then developing butter yellow color in the center at the onset of flowering. The color leaks from the center down the main vein into the surrounding blade to eventually form an oval shape. ‘Pink China’ – has green leaves on pinkish stems. It is one of the hardiest elephant ears, with anecdotal reports of survival in zone 5. ‘Stingray’ – is an Alocasia with a distinct tail on the end of the leaf. 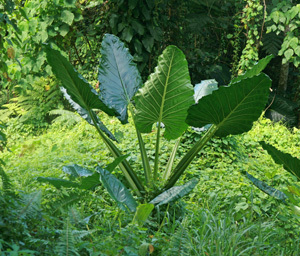 ‘Thailand Giant Strain’ – is a mammoth selection of C. gigantea with blue-gray-green leaves up to 5 feet long and 4 feet wide on a plant over nine feet tall under ideal conditions. This species requires better drainage than C. esculenta. 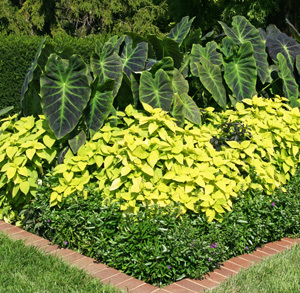 ‘Yellow Splash’ – is a yellow and green variegated type heavily splashed with creamy yellow patterns. 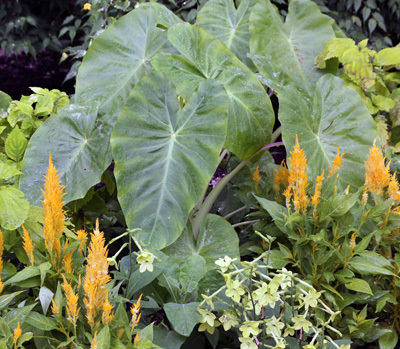 Elephant ears offer bold foliage in beds and borders. Elephant ears combine well with caladiums. Chinese hibiscus and mandevillea, but they also provide wonderful textural contrast with more typical temperate bedding plants, ferns, or ornamental grasses. Pair dark-leaved varieties with any white, yellow, or orange-flowering plant for vivid contrast. The clumping varieties have an attractive vase shape so a single plant can provide an interesting focal point in the garden when planted in the midst of low-growing annuals such as petunias or begonias. Add them to large aquatic containers in combination with papyrus and water lilies. Or keep them in individual containers to mix and match with other plants on a deck or patio. Grow dark-leaved varieties in full sun for best color. 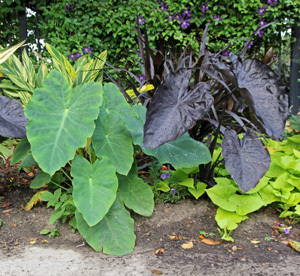 Many types of elephant ears can be grown in partial shade, but the darker colored varieties are best grown in full sun. 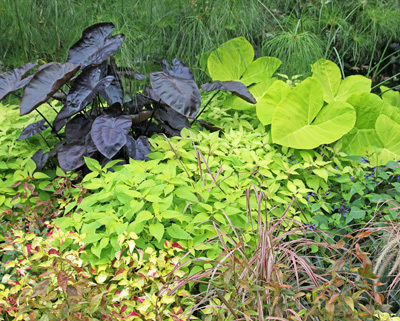 All need rich, moist soil and nearly all are perfect at the edge of a pond. Most can be grown in a few inches of standing water, and can be added to water gardens as emergent plants (the roots in water and with the soil just covered with water, but the plants not submerged). 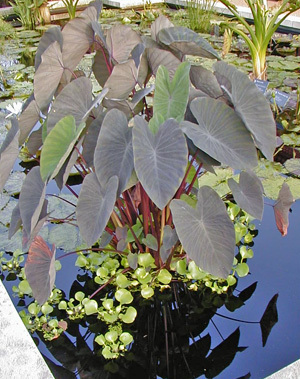 Dark-leaved elephant ear growing in a water garden. 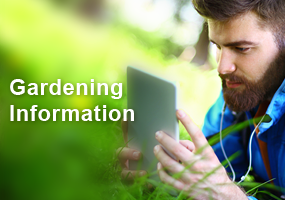 These tropical plants grow best in warm temperatures and high humidity. They may languish in Midwestern gardens until warm summer conditions begin, and they will also falter when temperatures drop below 50F for prolonged periods of time. 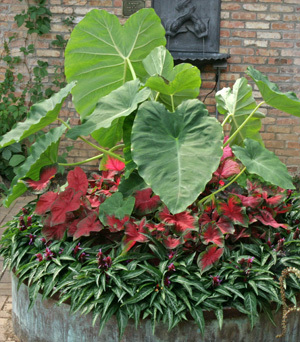 Elephant ears pair well with other foliage plants. The plants continually produce new leaves throughout the growing season. 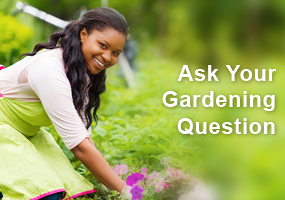 The older leaves that gradually die off can be removed to keep the plants looking tidy. 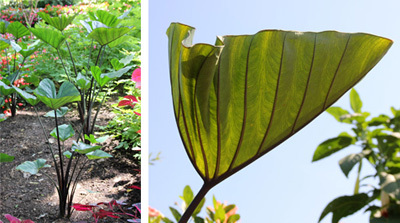 Be sure to consider the potential for the elephant ear to shade out smaller plants as they grow when you choose a planting location in the spring. Provide lots of water and fertilizer to grow large plants. 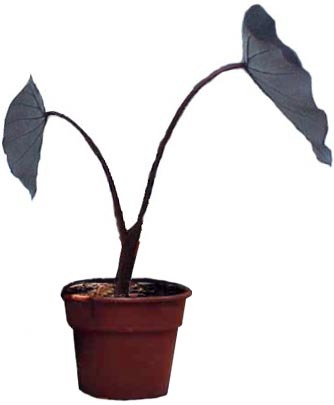 Although they can be grown from seed, to grow large elephant ears, start with a large bulb or rooted plant (many of the newer cultivars are only offered as tissue cultured plants that have not formed bulbs yet). It will take a few weeks for the first leaves to appear from the bulb. These frost-tender perennial plants are best started indoors, potting up the bulb in March, placing the top of the bulb close to the soil surface, and keeping it in a warm location until it is planted outside when the weather warms up, usually in late May or early June. Elephant ears are best started indoors in early spring and placed outside when the weather warms up. Provide copious water and fertilizer as the plants grow, especially for those in containers, as they are heavy feeders. 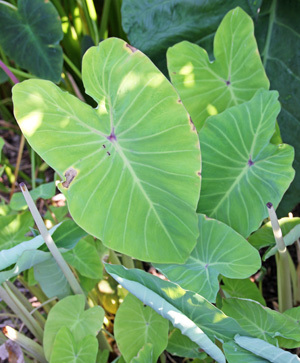 For plain green-leaved elephant ears, you can purchase taro (also called coco yam) root in Asian grocery stores and grow it instead of eating it (if the corms haven’t been treated with something to prevent growth). Although they are often treated as tender annuals, many types can be kept over the winter. Elephant ears can be grown as annuals, starting with new plants each year, or may be kept over the winter (most are hardy only to zone 8). 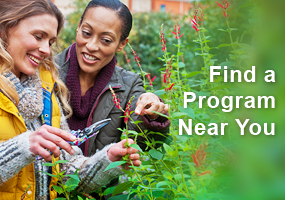 Plants that have formed bulbs can be dug, dried and stored like cannas or dahlias, after frost has killed the foliage. Illustris with other tender annuals. Those without bulbs are harder to keep indoors, although it may be possible to keep them going as houseplants if kept in a warm, bright location. It is best to bring plants to be kept as houseplants indoors before temperatures get into the 30’s. Cut back all but the top two leaves and keep at room temperature in bright light. Keep plants on the drier side when they are semi-dormant and resume regular watering and fertilizing when growth resumes in the spring. I really like elephant ears, they are among my favorites. I didn’t know they were edible. 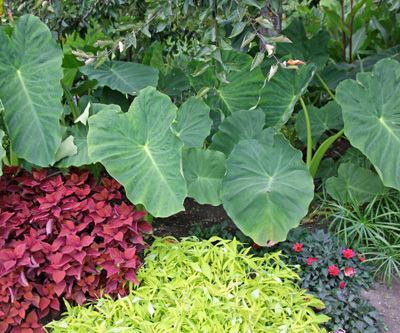 With the wide range of varieties of elephant ear you can use multiple types and sizes to make quite interesting plantings. We normally use spike plants to be the “thriller” in container plantings but will try the elephant ear in some this coming summer. Elephant ears give the ultimate thriller experience for a container. I had no idea how many variations in shapes/sizes/colors there are. I have always been a fan of the coral black, but I really like the Illustris vein beauty. Although not common, are there any types of elephant ears that are more likely to bloom in the midwest? We live in zone 7. My daughter has been in her house nearly 3 years. There is a large flower bed on a sunny side. There have been many different perennials pop up. The top tier has had day Lillies and small grasses come up. But recently..late August/early September several elephant ears popped up. We have no experience with them but are studying. My question is how have they survived without proper care? Why didn’t they appear the last 2 summer’s? I am really interested in elephant ears. I have added more tropical large plants to pots and love the different varieties. I want to find some that have bulbs so I can overwinter them.